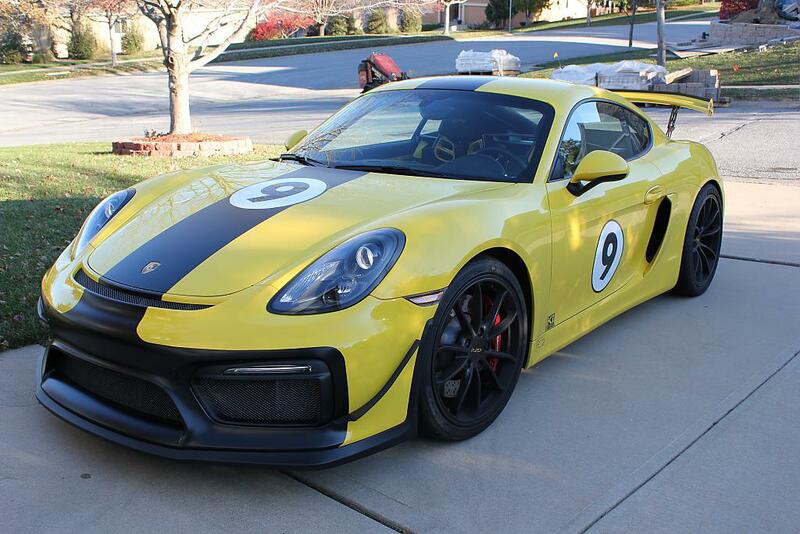 I would like to thank Justin Bellinzoni at Rennsport-One for providing me access to their track tested GT4 aero products. 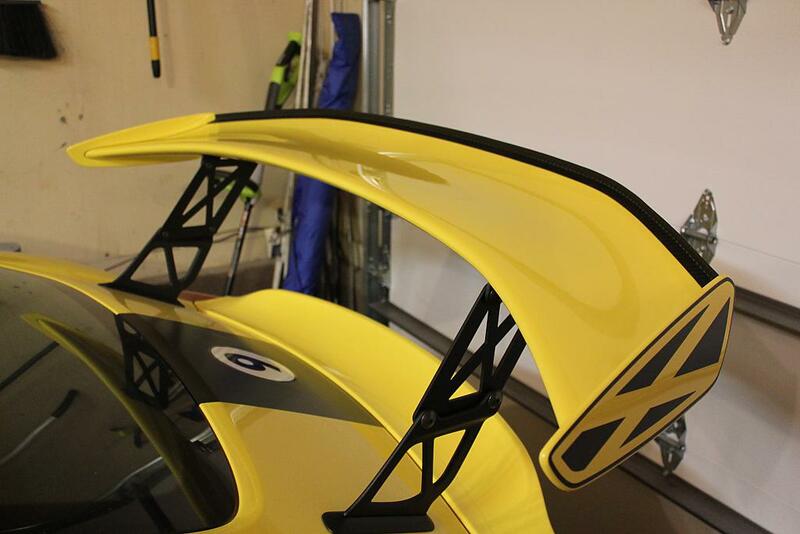 You can read about their GT4 race car and their associated products at www.rennsport-one.com . I decided to try out their dive planes and gurney flap. 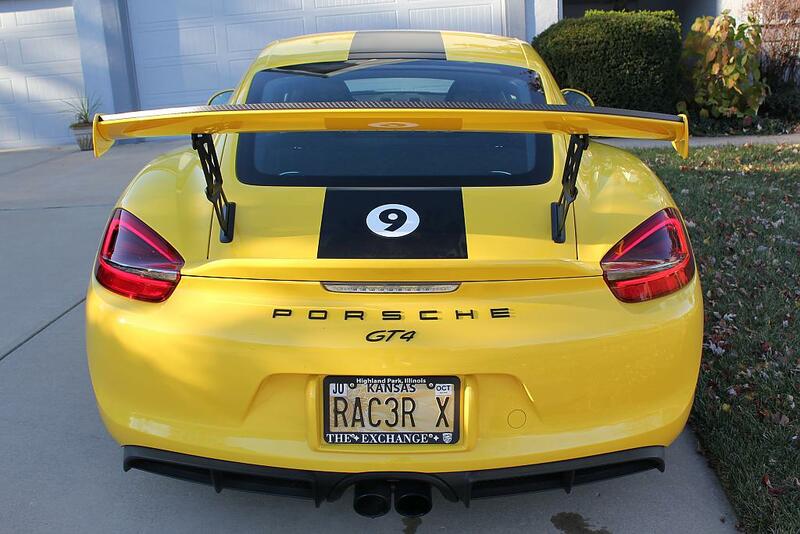 After all, the GT3's use both in race form, surely Porsche must be on to something. In fact, this was something I discussed with Justin during our first call. "Would I notice any difference after adding these two products to my car" I asked Justin. Justin was very forthright and said that during normal driving conditions, no, you aren't going to notice a difference in how the GT4 drives, BUT their telemetry data and track testing did show an improvement in downforce and stability at track speeds. For those who might be skeptical as to their effectiveness, please give Justin a call and he can walk you through all the numbers. 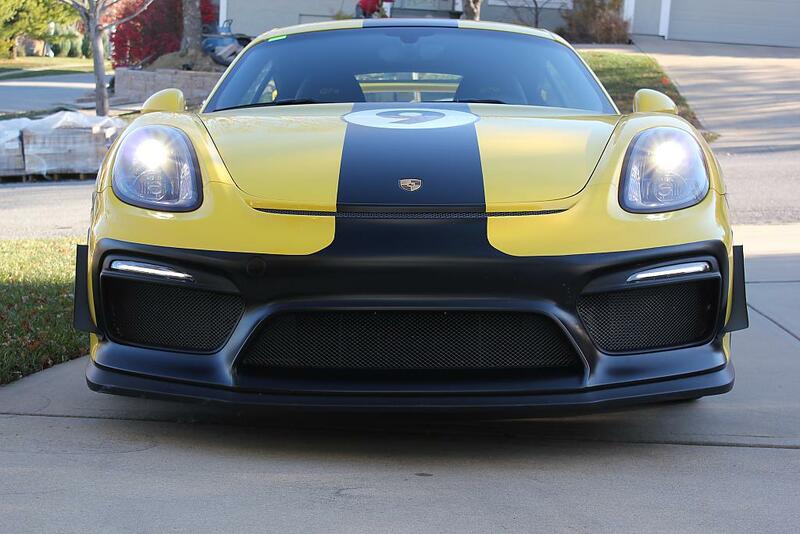 In my case, I am going for a certain "Racer X" look to my GT4, making it appear very similar to the "Shooting Star" car driven by Racer X, thus a yellow and black color scheme throughout. 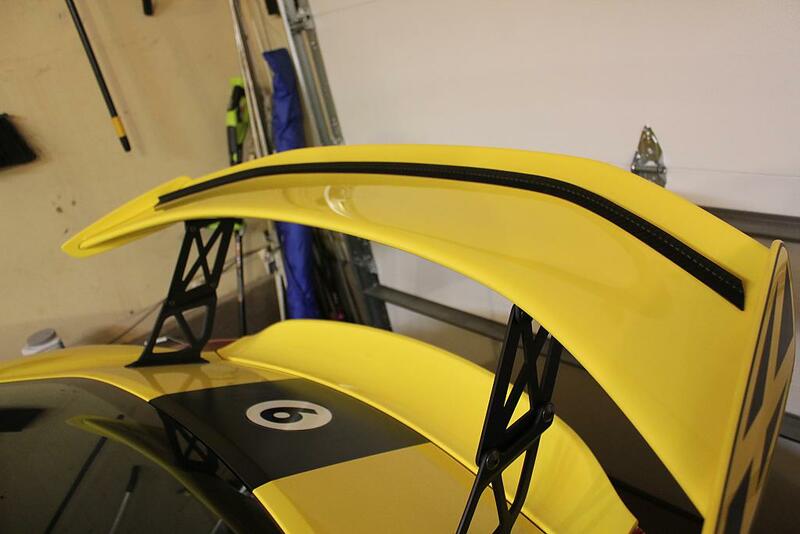 The extra black carbon fiber bits provided by the dive planes and gurney flap were just the thing to add some additional visual punch to the overall appearance of the car. The installation was super easy so let's get started with some pictures. 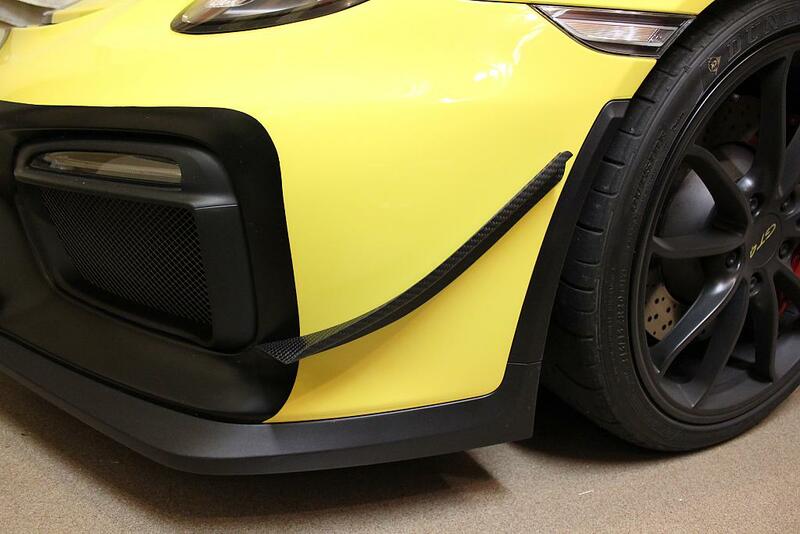 Up first are the dive planes, two curved carbon fiber pieces with a super strong 3M adhesive tape pre-applied by Rennsport-One. All you have to do is literally peel and stick the dive planes into place. With my car I simply held the piece up to my front bumper and positioned it at various angles until I found an angle that I thought best reflected the natural curvature of the dive plane piece. 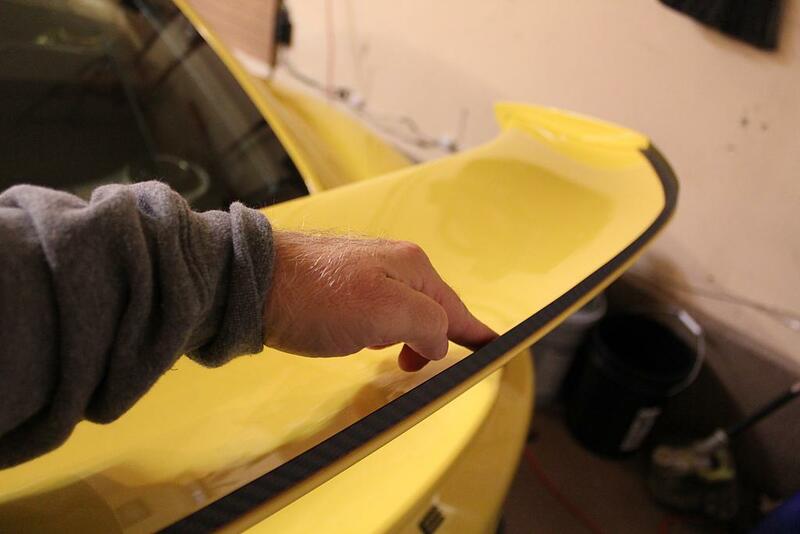 I peeled the strip off the adhesive and then carefully lined up the piece at the desired angle and position and then pressed the piece to the car. 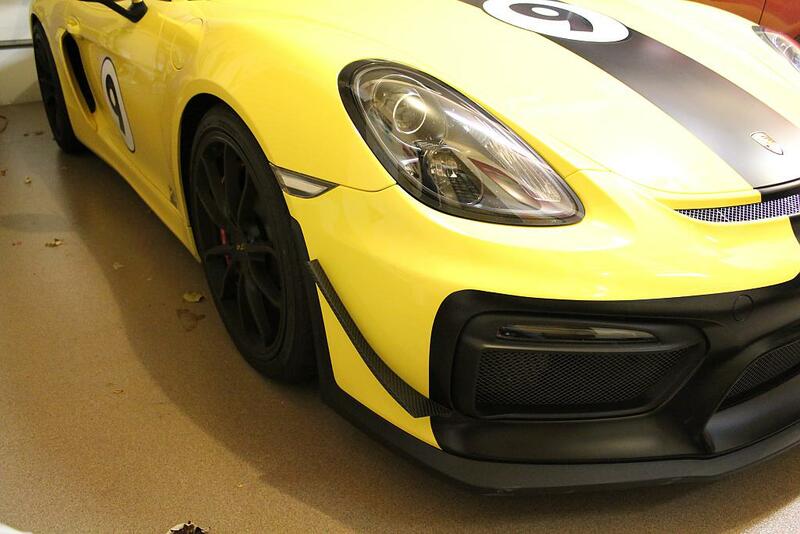 It should go without saying that you want your car to be clean where you are applying the adhesive strip. I found the best angle for me was from the lower part of the front radiator opening upwards towards the black plastic lip in front of the front wheel well as shown in the photo above. I then repeated the process on the other side of the car, trying to achieve as symmetrical of an installation as I could. Just like the dive planes, simply line up into position, peel and stick and you are done. The fit was excellent and the piece stayed planted firmly in place with the adhesive strip. Here are some pictures I took of the car after both items were installed and I pulled it out of the garage to take some photos. Please note it is adviseable to give the adhesive time to cure and firm up the hold on the car, in other words I wouldn't put these pieces on and immeidately go for a top speed run. 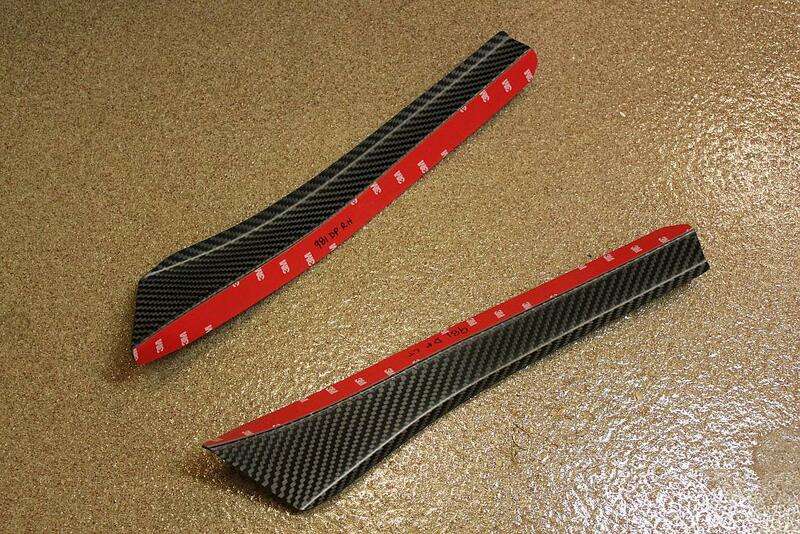 I would also advise installing in temps that are warm enough for the adhesive strip to be pliable. 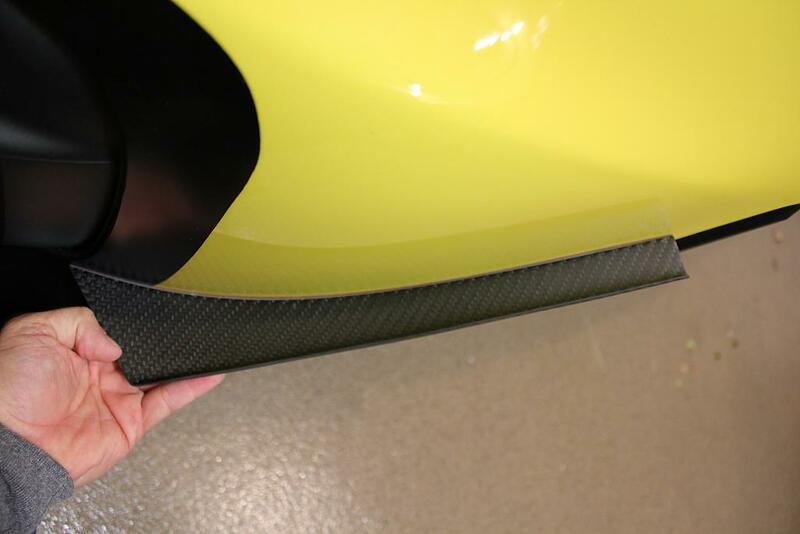 A visual inspection of the adhesive strip and fit of the pieces from time to time is probably also a good idea, especially if driving at high track speeds where these items are the most effective. Once again I'd like to thank Justin for developing these parts for our cars, I'm certainly pleased with the results. A couple of additional photos can be found in our Gallery section linked below. If you need more information or would like to order your own set just give Justin a call at 1-800-215-4070 and tell him that you saw this article on Planet-9! Please let us know what sort of article you'd like to see next.